The Chaplaincy is both a place and a team of people. We offer opportunities for students and staff to unwind and to explore faith and spirituality. The Meeting House is a dedicated space unlike anything else on campus. When you step through the door you immediately step away from the pressure of university life. Here you can ‘slow down’, soak in the peace of the 'Quiet Room' or enjoy a cup of tea or coffee in the lounge area – all for free! Chaplains are available throughout the week to offer a listening ear, personal help and advice, and spiritual support. You will always be met with a warm welcome and a respectful attitude. You don’t need to make an appointment – simply drop-by and enjoy the sanctuary offered. We’re committed to supporting the faith and spiritual needs of everyone at Brunel. We know that for many students and staff practising their religious devotion throughout the day is fundamentally important to who they are. This contributes to the rich diversity of our community and we have appropriate prayer facilities on campus for this purpose. 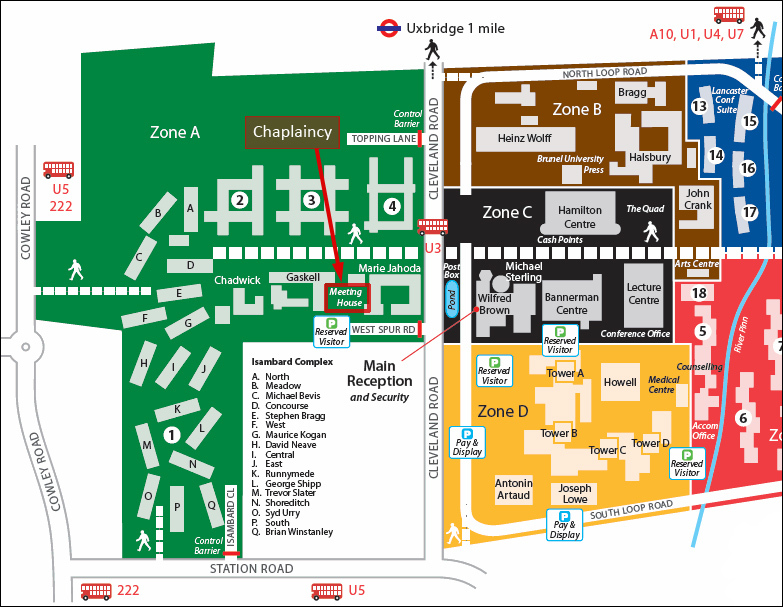 Students, staff and visitors who require prayer facilities whilst on campus can wash and pray throughout the day in the Isambard Complex, or use the Meeting House. Friday prayers take place in the Netball Hall. The ‘quiet room’ in the Meeting House is a small, peaceful room which is available for prayer, meditation and reflection. Or just to be alone. You can light a candle, play a relaxing CD, or sit and gather your thoughts away from the clamour of daily life. It is important to feel a sense of belonging, especially when you’re far from home and sometimes living in a different country. New friends can be made and existing relationships deepened through the many and varied activities hosted at the Meeting House. Not all of these have a religious nature! If you are seeking religiously-inspired activities and events, we offer a range of activities designed to support and nurture the needs of our faith community. These activities encourage sharing and socialising as well as prayer – and suggestions are always welcomed.